Nordic Walking is simply walking with what looks like ski poles. it gives you a full body workout, bumping up the calorie burn compared to normal walking. It also improves posture, helps release pain in the neck/shoulders region and reduces the load on all the joints in the lower body ie. hips, lower back and knees. The poles also increase the safety factor on ice and snow. Nordic Walking is ideal for the outdoor lover and anyone who wants to bump up their walks without the jarring impact of running. Nordic Walking is for all fitness levels and is a perfect couples activity. Classes are approx. 60 min. Locations will be sent out in weekly emails. We walk various locations in Pickering/ Ajax & Scarborough. 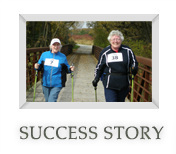 Nordic Walking poles are provided and also available for purchase. Various styles and prices. Please contact Rosi for more info. **Sign up for two sessions, receive 25% off the second session! ***Family members joining also receive a 25% discount on the second registration.